How much do Midwesterners care about climate change? “The back of the envelope political calculation is that this region is the least interested of any in the subject”, says an official at Chicago’s city hall. He notes how the last coal-fired power station inside Chicago’s city limits was closed only in 2012. The further you are from America’s coasts, say pollsters, the weaker the concern. According to Pew Research, two-thirds of coastal dwellers report seeing local effects of climate change; only half of those who are 300 miles or more inland do so. Pollsters also say that younger respondents, those likelier to move to cities and the coasts, and those who lean Democratic, are especially worried. America’s Midwest is more rural and Republican than average, with a higher median age, and is trying to hang on to heavy industry. Yet Midwesterners are being pressed to think again. Rising sea levels or fast-moving forest fires that ravaged California this year might not threaten America’s heartland. But other changes do. Take agriculture which suffers as soil dries, rain falls erratically and winters get less cold. The National Climate Assessment, published late in November, warned of especially sharp rises in temperature in the Midwest, along with more intense rainfall and periods of drought. Research published in December by Ariel Ortiz-Bobea of Cornell University concurs with that. He suggests farmers are already enduring lower yields than they would otherwise, had climate change not been under way. Those who grow crops—the region depends heavily on harvesting corn and soy beans–see productivity suffer from big changes in the weather, especially hotter summers. Mr Ortiz-Bobea studied the impact of increasingly frequent drought years, notably in 1983, 1988 and 2012, and concluded that farmers’ productivity grew more sensitive to changing weather in the years since the 1980s, compared with an earlier period. Though some farmers gain (especially in the north) from longer planting and harvesting seasons, “the region is more vulnerable than we’d like to believe”, he says. More warming in the coming decades will mean sharper declines in the potential yield. Kim Novick, a colleague at the School of Public and Environmental Affairs, adds that less cold winters “change the spatial distribution of pests”, that threaten crops. 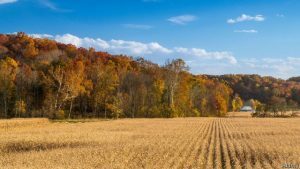 The combination of “drier soils and impaired plant function is projected to cause Midwestern crop yield to decline by 10-20% at the century’s end” she says. That is not catastrophic, but it would be costly. As troubling, she argues, is the impact of drier summers on forests in the southern parts of the Midwest. Trees helps to cool surface temperatures and act as a big carbon sink, absorbing carbon dioxide from the air as reforestation has taken place in the region since the mid-20th century. But hotter and drier summers also mean “trees are sensitive to reduced soil moisture and impaired function linked to drying air”, she says. That threatens their health and potentially means the release of substantial carbon deposits sored in tree biomass. Extreme weather events are a more immediate threat. Summer floods in Wisconsin hit farmers last year: the south of the state saw more rainfall in 15 days late in August than it would usually see in six months, the third large-scale flood of the past decade. The mayor of South Bend in Indiana, Pete Buttigieg, describes how his city also suffered two unusual floods in the past couple of years, “one in one-thousand year events” he says, as intense rainfall and sudden melting of snow led to the inundation of residential areas. No single incident can be blamed on climate change, but it appears such events are growing more frequent. “We have to demonstrate that this is not a coastal issue, or about the Arctic alone. This stuff is impacting us. People need to understand climate change is happening in the Midwest now, it is not theoretical”, he says. In bigger cities another concern is extreme heat and poor quality air in the summer, both influenced by changes in the global climate. On average Chicago saw only two days a year when the temperature exceeded 37.7 degrees Celsius (100 Farenheit) in the three decades before 1990. That has risen to five days, and (assuming global emissions continue to rise fast) is set to rise to annual average of between 16 and 31 days over the rest of this century, say city authorities. The city warns of significant costs to human health and to city budgets as heat damages roads and energy demands rise. Is the region responding? The recent arrival of Democratic governors in several Midwestern states that were previously Republican-run, such as in Illinois, Kansas, Michigan and Wisconsin, is likely to mean some more interest in efforts to mitigate greenhouse gas emissions. Some farmers have started to change practices, given incentives to trap more carbon in the soil by growing winter crops of clover and rye, or reducing tillage of the land. Cities, in addition, roll out plans for more public transport, local production of renewable energy (Chicago is to put up solar parks on its south side), regulations to make buildings more energy efficient and to promote electric vehicles. Rahm Emmanuel, the departing mayor of Chicago, advocates a big increase in taxes on petrol both to raise revenues and discourage pollution. Even in more conservative areas, such as Catholic-dominated parts of Indiana, interest in climate change is reportedly increasing. Mr Buttigieg suggests that since Pope Francis published an encyclical on the environment in 2015 residents in more rural parts of his state have grown more interested in the topic. Market changes as solar and wind power become cheaper and old coal plants close, meanwhile, are anyway causing a shift to more use of renewable energy. Many states have set goals for minimum electricity production from renewable sources—in Illinois for example 25% will be from renewables by 2026. But even states, like Indiana, with no such formal targets, are seeing a rapid shift. David Konisky, also at Cornell, laments that what is missing is any coordinated regional activity, for example between the states, since the collapse a decade or so ago of an old idea to trade carbon credits across the Midwest. “We are long way from any coordinated effort”, he says. This could be a moment for renewed ambition. Pew researchers say that two-thirds of Americans believe the federal government, under President Donald Trump, does too little to tackle climate change. If voters care, then state governments and cities could respond faster.